The HS-6A Telephone-Style Intercom Handset (White) from Telex lets you use your intercom in comfort and style. 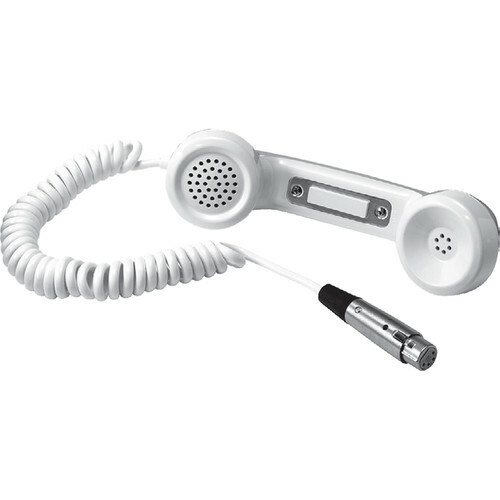 The handset is held like a traditional telephone receiver for terrific ease-of-use. It has a push-to-talk switch so you know exactly when the handset is active. The dynamic microphone has an omnidirectional polar pattern for clear vocal pickup, while the dynamic earphone lets you hear the other party perfectly. The coiled cable stretches to provide a flexible amount of slack, and the A4F connector is compatible with many common intercom systems. A metal hanger bracket is included for convenient vertical storage.